This page links to 10 sub-articles that discuss the leading health risks faced by Asian Americans. Becoming aware of these peculiar risks in time to affect lifestyle changes or secure medical help that can eliminate the biggest causes of deaths and debilitating illnesses for this population. Some factors that disproportionately affect Asian Americans include smoking, low rates for cancer screening, low rates for mental health service use, and poor knowledge of health issues. It’s also important to note variations of risks among this heterogeneous segment. For example, one in ten Japanese and Vietnamese Americans are underweight, but almost one-half of Filipino Americans are overweight or obese. Asian Americans had the highest annual percentage increase of HIV/AIDS of all ethnic groups in the US between 2001 and 2004: 2.4% for men and 14.3% for women. Its potential coinfection with tuberculosis and hepatitis B make HIV/AIDS an even greater concern within in the Asian American community. Hepatitis B is the most significant health disparity affecting Asian Americans in the US: 10% of Asian Americans are infected with chronic hepatitis B compared with .1% of Caucasians. 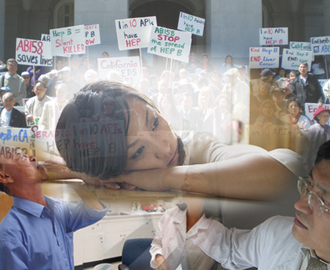 One in seven Vietnamese Americans is a chronic carrier of hepatitis B. The Asian American population has the highest tuberculosis case rate of any ethnic group: 24 times greater than Caucasians. Additionally, 80% of the population in many Asian countries test positive in tuberculin tests, while only 5-10% of the US population test positive. 20% of Asian women older than 50 have osteoporosis and over 50% of them are at risk. Asian American women are at a higher risk for developing osteoporosis compared with Caucasian women. Asian American women older than 65 have a suicide rate of 11.6 per 100,000—more than double the rate for Caucasian women in that age group. Out of over 2,000 Asian Americans aged 18 or older, 2.7% reported having attempted suicide at some point in their lives and 9.1% of the group reported having had suicidal thoughts. Lung cancer is the second most prevalent cancer among Asian American men and third among Asian American women. Lung cancer rates among Southeast Asian Americans are 18% higher than among Caucasians and Chinese Americans have the highest death rates for lung cancer among Asian American groups. Asian Americans are a high –risk group for diabetes type 2. The risk for type 2 diabetes occurs at a lower BMI for Asian Americans compared to other ethnic groups. Additionally, while diabetes was the seventh leading cause of death in the US in 2006, it ranked as the fifth among Asian Americans. The incidence rates of liver cancer in Asian American groups are 1.7 to 11.3 times higher than the rate among Caucasians. Additionally, Vietnamese American males have the highest incidence rates of liver cancer out of any other group in the US. Asian Americans are three times more likely to die of liver cancer than Caucasians. Asian American women have one of the highest rates of cervical cancer in the US and Vietnamese American women in particular have an incidence rate five times higher than Caucasian women. Identify and stop these health risks before they turn your life into a waking nightmare.